It is no secret to locals that South Medford is one of the best places to go in the Boston area for Italian food, but if you are a tourist, business traveler, or newcomer to the region, chances are you've never even heard of this close-knit neighborhood just west of Route 93. But South Medford indeed has a lot to offer, including everything from Sicilian bakeries to cozy restaurants to pastry and pasta shops to food markets/Italian delis. 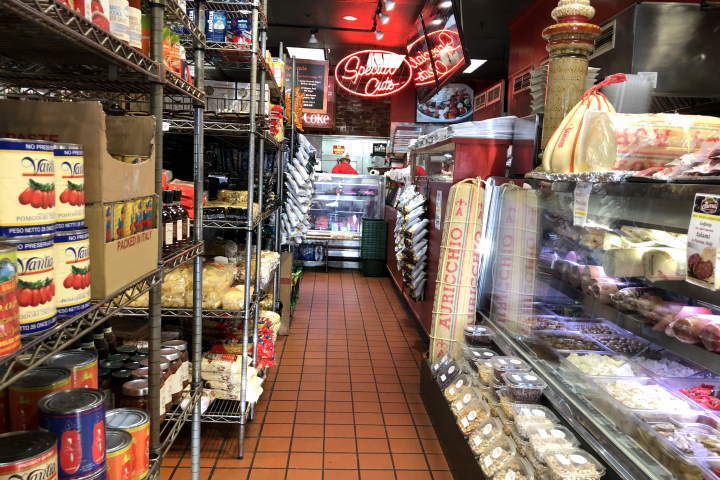 And it is this last category that is the focus here, with Bob's Italian Foods being considered by many to be one of the best places in Metro Boston to get sandwiches, pasta, Italian food supplies, and more. South Medford is a compact area, with most of its shops and restaurants being concentrated at or near the intersection of Main Street and Harvard Street, but a short walk south will bring you to such places as La Cascia's Bakery and Italo Bakery (both of which have outstanding Sicilian pizza, by the way) while a short stroll north will bring you to Bob's. Unlike La Cascia's and Italo, Bob's is a bit more of a grocery store with all kinds of items found in its two aisles, including olive oil, anisette sugar, pine nuts, house-made pasta (the ricotta-stuffed rigatoni is marvelous as is the ravioli with smoked mozzarella and basil), cheese, sausage, Italian cookies, tomato sauce, olives, stuffed peppadews, and much more. As you reach the back of the market, it turns into more of a sub shop or deli, with people placing their orders for sandwiches, dinners, pizza, and other items, then wandering around the store (or waiting) while their orders are completed. The overall vibe of Bob's is that of an old-fashioned neighborhood store, with a friendly (and often funny) staff and a particularly nice feeling around the holidays when the store has a festive feel and seems quite a bit like a spot from another era. The back counter at Bob's is where locals (and those in the know) come for some truly great meals to take home, and the list of highlights is a long one. Perhaps the best option of them all here is the sublime Italian sub, with their "Delux Imported Italian" being the one to get; this mind-blowingly-good sandwich includes top-line meats (options being mortadella, sopressata, and prosciutto), provolone cheese, diced pickles, hot peppers, tomatoes, and oil and vinegar, all in a warm and soft braided sesame seed roll. Other sandwich options are outstanding as well, with their eggplant parm, meatball sub (with some of the best house-made meatballs in the Boston area), Italian sausage, roast beef (and the marvelous roast beef and cheddar sub may be the way to go), an old-school potato, egg, and cheese sub, and an equally old-school grilled eggplant, roasted peppers, and provolone sub all being worth ordering. Bob's also sells pizza, and like its aforementioned neighbors, it is of the Sicilian/bakery variety--large square slices with a thick and slightly spongy crust, a sweet-tasting sauce, a good amount of cheese on top, and toppings that include pepperoni and another with the works. Other highlights here include a very nice version of a steak and cheese (the steak bomb will probably induce you into a nap shortly after eating it), a delicious chicken parmigiana dinner, a marvelous lasagna with ground beef and just the right amount of cheese, steak tips that actually rival some of the best in the Boston area, a solid chicken, broccoli, and ziti dinner, an Italian cold cut calzone that features the same meats used for the Delux Imported Italian, and classic steak fries. Bob's Italian Foods may be a popular spot among folks who live in or near South Medford along with food critics and those in the know, but that doesn't necessarily mean it's not a hidden gem; ask people west or south of Boston (or in Boston proper) about this wonderful spot and there's a good chance they've never heard of it. And that is probably just fine with locals, as it more or less remains their little secret after more than 70 years in business. Copyright © 2015-2018, Boston's Hidden Restaurants (www.hiddenboston.com).